Interview with Dr. Gustin, a board certified sports physician and functional medicine practitioner, chatting about exogenous ketones – what they are, how they work, when and how to use exogenous ketones, ingredients in exogenous ketones, problems with the exogenous ketone market, and so much more. I’ll be the first to admit that I never, ever, thought in a million years that I’d be supplementing with exogenous ketones, let alone sharing them with you. But meeting many of you on the book tour, and speaking to individuals that have supplemented with ketones to compliment their ketogenic diet and help make the transition easier, I owed it to our crew to do some additional research, and here we are. Today, I interviewed the down-to-earth owner of Perfect Keto, asking him about all things exogenous ketones. From what they are, signs that you need them, signs that you don’t, the difference in products, ingredients used in exogenous ketones, whether they’re FODMAP or not, diet culture surrounding the product, accessibility issues, how exogenous ketones are digested, whether they lead to limited fat burn, and more. 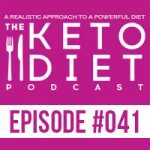 Leanne Vogel: You’re listening to Episode #41 of the Keto Diet Podcast. Today we’re chatting about everything exogenous ketones, what they are, signs that you need them, signs that you don’t, the difference in products, the ingredients used in exogenous ketones, whether they’re FODMAP or not, diet culture surrounding the product, accessibility issues, how exogenous ketones are digested, whether they lead to limited fat burn, and so much more. Stay tuned. Hey, I’m Leanne from healthfulpursuit.com, and this is the Keto Diet Podcast, where we’re busting through the restrictive mentality of a traditional ketogenic diet to uncover the life you crave. What’s keto? Keto is a low-carb high-fat diet where we’re switching from a sugar burning state to becoming fat burning machines. All listeners of the podcast receive a free seven-day keto meal plan complete with a shopping list and everything you need to chow down on keto for seven whole days. Download your free copy at healthfulpursuit.com/ketomeal. The link will also be in the show notes for today’s episode, perfect if your daily keto meals have become a bit lackluster if you’re new to keto and a bit lost when it comes to eating what and how much or thrive on being guided on what to do and when to do it. Again, that’s healthfulpursuit.com/ketomeal. Let’s get this party started. Hey guys, happy Sunday. I’m so thrilled that you’re here hanging out with me today. The show notes and full transcript for today’s episode can be found at healthfulpursuit.com/podcast/e41. The transcript is added to the post about three to five days following the initial air date of this episode. Let’s hear from one of our awesome partners. If you have an idea for a podcast episode or you want to submit praise over and above the review, which you can leave by going to healthfulpursuit.com/review, you can reach me at info@ketodietpodcast.com. I have one quick announcement. It’s more of a thank you. My paperback book, The Keto Diet, is doing so well because of your help. I am just beyond excited. We’ve hit Globe and Mail Bestseller, we’ve hit No. 1 Cookbook by Publisher’s Weekly of all of the cookbooks in the USA. I’m rocking the US and we’re rocking Canada. I just want to thank each one of you that has supported this process. The last year and a half have been a huge struggle for me to put all of my thoughts into words on paper and overcome a lot of fears that come with that. Everyone who has come out to my events and we’ve hung out together or have left a review for the book, thank you so much for making this a reality for Healthful Pursuit and really, our community in general. Before we get started with the interview today, I just wanted to put in some groundwork before we get started. If you guys remember from Episode #35, I told you that I was sort of in support of exogenous ketones and I went through what my thoughts were on that. I just want to reiterate, if you didn’t listen to Episode #35, please do so that you have an idea of where I’m coming from. I was against exogenous ketones from the very beginning for multiple reasons that we’ll get into in a second, but what changed my mind was when I went on the book tour, and I met with oodles and oodles, like thousands of you, talking about exogenous ketones and their use in your diet. I had many women and men come up to me and say that they couldn’t live without this product and that they were suffering because it was breaking the bank. Many people said that they were using it to get into ketosis. One lady had been in keto flu for six weeks and then used an exogenous ketone product, and she was in there in three days. She used it for a couple more weeks, and then she stopped using it and was able to continue on her ketogenic journey. I realize that by connecting with many of you, you inspired me to look at the options out there. In fact, in Seattle, I believe it was, one of the individuals that were there at the signing recommended Perfect Keto. I reached out to them, checked out their marketing, felt pretty good about it, tried their product, and was pretty happy with the outcome. A couple of concerns that I had with exogenous ketones from the very beginning is that many of the products out there, many of the businesses that are selling those products, kind of use it to erase eating choices. I also feel like they shouldn’t be used in conjunction with excess carbohydrates or carb up, and that they shouldn’t be used to extend your fast beyond what your body is comfortable with. When I tried Perfect Keto, I was able to go more than two days without eating, and I knew that that was a big issue for me. I had to come down off of the exogenous ketone product and only use it a couple of times a week as opposed to every day when I went into it. It’s not to be used to lose sight of why you started keto in the first place. If you’ve been following me for a while, your goal with keto is probably nutrient density and healing your body. Perhaps it’s even weight loss, but sometimes we can lose sight of what’s important to us, and we get caught in this place of just losing ourselves. That’s happened to me on keto; it’s happened to me in a bunch of different situations. I could see that exogenous ketone products can bring that out in people. If you’re keto fasting, feeling great, you don’t need this supplement. I find that people rely on it too heavily, and that’s why I’ve never promoted it. This isn’t me turning to the dark side; this isn’t me doing a complete 180. This is me listening to what the people are saying that they’re doing and not being oblivious to what’s happening around me. If there’s anything that I’ve learned being in the health and wellness industry for over a decade, it’s that if you don’t ebb and flow with the industry and where things are going, and listening to thought leaders, and connecting to different messages, and changing your message with what you learn about your body and the people that trust you and that have had experiences firsthand, then you’re gonna go nowhere. You gotta change, and you gotta admit that when you’re wrong, you’re wrong, and adjust things accordingly. I chose Perfect Keto for a bunch of different reasons. This is one exogenous ketone product. I’m going to talk about my experience with Keto OS in a second, but the reason I chose Perfect Keto was that they say that it is to compliment your ketogenic diet. It’s less cost per serving than other brands. While it may be about half of other brands, maybe a bit less than half, it’s a lot less costly per serving. It doesn’t contain artificial scary ingredients. Some of the exogenous ketone products that I’ve found contain a lot of crazy things. Also, their processing isn’t of the highest quality. We’ll talk about that in the interview. The amount of BHB is labeled on their container, and you can order right from their website, making it more accessible for people. Whenever I work with a brand, and I don’t know if I’ve ever spoken about this on the podcast or anywhere else, when I find a product that I really love and I want to promote it, there are a couple of things that I need to see in a brand before I will promote it. The reason this is is because there are so many people listening that will just purchase the product. I take that very seriously. I’ve been duped before by other bloggers where they say, “Buy this product,” and I don’t even look at the ingredients. I don’t even look at anything; I just buy it. Then I get it, and I’m like, “What the heck?” I never want you to have that experience, so there are a couple of things that I look for in a brand. The first is, do we align in about 95% of our beliefs and thought systems? You’re never gonna find a brand, at least it’s very rare to find a brand, that aligns with you 100%. I like to say 95%. Sure, some of their blog posts I won’t necessarily agree with their thoughts, but 95% of the way that they do their marketing, and how they reach out to people, and even how they treat me is a big deal, and how they treat their customers, and how their customer service is. Then another piece is, do I love the product? Of course, I need to love it, and use it, and integrate it into my life so I can explain how to integrate it into yours and also experience it firsthand. Because of that reason, that’s why I do not personally like to promote Keto OS. There was a question in Episode #35; I shared my thoughts about exogenous ketones. I talked a little bit about Keto OS, but I didn’t go totally into it just because I don’t like to bash other companies. Sometimes I choose to promote certain things that align with my thought process better and that I feel are just a better company overall personally. That’s not to say that anyone that promotes Keto OS, or has changed with Keto OS, or has seen momentous shifts in their life because of this, that I’m discounting their experience. It’s just not something that I align with. I’ve tried Keto OS. In fact, the first time I tried it I thought it was rotten because it tasted so weird to me. I didn’t like it. Kevin’s tried it a couple of times; he didn’t like it. Also, the marketing bothers me. There have been multiple times where individuals have shown up when I’m on stage when I’m speaking. They have been aggressive and the marketing piece around not necessarily knowing what keto is. There have been many individuals that are selling this product, and when I ask them about the ketogenic diet, they don’t know what I’m saying. I don’t feel comfortable sharing that product with people that trust me to make the right choices and to share the right things. That’s just a personal thing. I hope that comes across as me not turning to the dark side. I just saw that people were using exogenous ketones, and I felt like it was my responsibility to figure out which one would be best for them. That’s how I landed on Perfect Keto. There were also a couple of questions about exogenous ketones overall. Somebody asked, “Do you do it to help extend your fasting period? Do you mix it with your RFL in the mornings?” Yes, you can use it to extend your fasting period if you’re already ketogenic or even if you’re not, and we’ll talk about that in the interview. I do not mix it with my RFL in the morning. I’m gonna try that and see how it goes, but I would imagine it wouldn’t taste very good. I just mix it with water. Another question was, “Could being in ketosis 100% of the time by using exogenous ketones be part of the reason someone may be struggling with amenorrhea even though they incorporate carb ups?” Um, no. I think a state of ketosis doesn’t mean that you’re gonna get amenorrhea. I would say that a couple of things that you want to look at is eating enough, not forcing yourself to fast, and also not eating enough, not forcing yourself to fast, and having carb ups, which it sounds like you’re doing. If exogenous ketones are naturally giving you a longer fasting period, I would say that indirectly, it could be not helping your amenorrhea. If you have amenorrhea and you’re finding that when you take exogenous ketones, you’re not eating as much, then that’s gonna be a problem. Usually, to overcome amenorrhea, you need to eat more. Another listener question said that she used Perfect Keto and felt awesome on it for a few days. Then she started to feel terrible with blood sugar in the 60s and very high ketone readings. “Is it possible to use the product along with a ketogenic diet and have it work too well and cause a person to feel physically sick?” Yeah, totally. If you’re the type of body that doesn’t resonate well with high ketone numbers, yeah. I’ve met a couple of clients that once they get over that three millimoles per liter mark, they just don’t feel good. If you just don’t feel good and you know what’s causing you not to feel good, then stop what’s not making you feel good or just lower it down until you start to feel better. You may find that you don’t need this product, which your body creates enough ketones and you’re good to go. Our guest today is Dr. Anthony Gustin. He’s a board certified sports physician, a functional medicine practitioner, and overall food and fitness, skeptic. His focus recently has shifted from private practice to creating products that improve the accessibility to whole food nutrition and ketosis with his companies, Perfect Keto and Equip, in addition to publishing his health reports on his website, dranthonygustin.com. Let’s cut over to this interview. Hey Anthony, how’s it going? Anthony Gustin: I’m doing excellent. How are you? Leanne Vogel: I’m good, thank you. I’m really good. For listeners that may not be familiar with your work, why don’t you start off by telling us a little bit about yourself? Anthony Gustin: Yeah, I’m gonna bring it back a few years, so it makes sense. I am a functional medicine clinician and sports chiropractor. I practice in San Francisco. About four years ago, I graduated from chiro school and went through the path of sports medicine as well as function medicine and helping a lot of people. The common theme that I saw with most people was that even when we would fix a lot of mechanical issues and even if we dive deep into their blood work, nutrition was the biggest problem with what they were doing, not hitting on whole food nutrition and getting real foods. I started using nutrition to be able to modify a lot of things, sports injuries, recover, rehab, as well as fixing the gut, healing hormones, adrenals, stuff like this. As I was doing that more with more patients, I realized that it wasn’t necessarily a problem with people having the knowledge about the food, it’s more so the accessibility to the food. That’s what led me to the next phase from being a day-to-day practicing chiro to growing the businesses that I have now, which I’m trying to fix more of the accessibility around whole food nutrition. That’s spun into two different companies. One is called Equip, where we have whole food products, and then another one, which I was using ketosis as a therapeutic tool in my clinic for a lot of my patients who have either diabetes, or cancer, or metabolic issues, weight loss issues, so also increasing the accessibility and the ease of which to do ketosis with Perfect Keto. The day-to-day is running those two companies. Leanne Vogel: Awesome. Let’s focus in on exogenous ketones because we have so many questions from listeners, and readers, and people that have been following Healthful Pursuit for a while. Why don’t we start off with the very basics of what are exogenous ketones? Anthony Gustin: I’m sure your audience is pretty familiar with this stuff, but to bring it back, ketosis versus eating carbs is essentially running on fat instead of carbohydrates. What an exogenous ketone is this is a breakdown supplementally of what your body will be running on when it breaks down fat. It will break down fat into a few different ketone bodies, one of the most prominent ones would be beta-Hydroxybutyrate. That’s the one that floats around in your blood and can go into more tissues, and your body can use to generate energy in a more clean way, you could say, than a carbohydrate. What an exogenous ketone is, generally your body makes the ketones from the breakdown of fat. That would be endogenous, in your body. Exogenous would be outside of your body, any ketone sources that you’re getting from an external source. Leanne Vogel: By supplementing with exogenous ketones, why would one want to do that? Why wouldn’t they just allow their body to do the magic that it can do naturally? Anthony Gustin: There’s a lot of reasons why. I was getting into this myself, seeing a compliance with a lot of patients. When people, especially for therapeutic reasons, it’s not very easy to get on a ketogenic diet. If people have hormonal problems, adrenal problems, they have appetite issues, or if they have blood sugar dysregulation, going straight into a ketogenic diet is very challenging. This would help bridge one into a ketogenic diet. Sometimes when people have ketones in the first place, it’s not gonna magically put you into ketosis with the snap of a finger. I wish it were that easy, but what happens is your body then gets a dose of this that you can break down and use for energy. With that, transitioning and doing it nutritionally, which is important here, again this is not a magic pill, then the bridging the gap from a traditional diet or a heavy carb diet, sugar burning to fat burning, is a much easier process. I’ve even seen it with myself, and I feel like I have pretty good nutrition. Going from carbs to eating a moderate carb diet into a ketogenic diet, a transition for me is much easier, and I think I have it relatively easy as I’m a pretty healthy guy. Seeing that with my patients was a huge deal. That’s one of the reasons. Two of the reasons for me that we’ll get into were mental clarity and focus and performance. What I mean by that is even if I’m eating a ketogenic diet, I usually float around between about 1 to 1.5 millimolar with a nutritional ketosis, which is enough for me to feel great. My biomarkers look fantastic. For me, for a healthy diet as an individual, that’s a very good spot for me to be. However, I feel best mentally when I’m at about a 3.0 millimolar. I can’t get there without exogenous ketones, so for me, it’s almost like a little boost that I have in the morning to be able to get into the highest functioning state for mental clarity where I do most of my creative work and work output in the morning. For me, that’s another way. Everybody’s an individual so their response to this type of stuff, some people might feel great mentally at about 1.5 millimolar with nutritional ketosis and they end up needing eight. I’ve just found that for me, it’s a little bit different. Another one would be when I was into nutritional ketosis and not having any ketones when I was working out, I don’t do CrossFit but kind of a CrossFit workout, it’s high intensity, I would feel awful. Even if I added carbs before or after, or tried to do carb cycling, or target a ketogenic diet, which sure, your audience is familiar with, but it’s just adding a few carbs in a round the workout or having it just be fasted or being pre-workouts, I would feel terrible no matter what. I use the exogenous ketones targeted around a workout. When your body, especially when you’re going through explosive exercises, it’s not a very quick process to break down fat into ketone bodies to use for energy. Your body can’t do that well in short burst intense workouts. Supplementing with exogenous ketones, you’re giving your body a whole lot of energy that it can use very rapidly. My workouts have changed dramatically since that. I think that this is a point where people … I wasn’t the only one who said this about their performance dropping on a ketogenic diet. I don’t recommend it for people who are competitors. I work with a lot of high-end pro athletes and CrossFitters. A ketogenic diet for them for the phrase that they’re at with competition, I would never recommend it because it does not fit with a high output on a competitive level. My priorities are feeling good, longevity, and mental clarity. While I want a effective and good workout, that comes first. That’s why I’m on a ketogenic diet and workout, but people complaining about low energy and lack of output doing things like CrossFit on a ketogenic diet, if you’re not a competitor, using exogenous ketones can be a really good way to bump it up and give your body energy that it needs before the workout. Leanne Vogel: It sounds like this product can be really good for people that are working out if somebody wants to boost their ketone level. Say they’re already eating ketogenic, but they tend to be a bit lower like my husband always registers around 0.8. He really can’t get higher than that; he just can’t. Whereas me, after three days of eating keto, 2.3 millimoles and I just kind of stay there. For me, it was never really an issue. The reason why I gravitated towards your product, towards exogenous ketones overall, is that although I don’t have issues in getting into ketosis, there are so many people out there that sit in that lower range, don’t feel optimal, or they’re in keto flow for six weeks non-stop. Anthony Gustin: Yeah, that’s where the metabolic issue that everyone is so different. There is no one size fits all with any of this stuff. While I could say this product or exogenous ketones or just a ketogenic diet will work this way for all people, it’s just not even true whatsoever. I wish everybody would get consistently great results, but everyone is so different when it comes to metabolism. Leanne Vogel: You also mentioned that it could also speed up the process of becoming ketogenic. Is there a period where you would say that exogenous ketones are best for, and do you have to take them every day? For example, if somebody is eating keto for a couple of days, and they’re not feeling optimal, and they use exogenous ketones, once they’re in ketosis, what kind of protocol might be best for them to continue to use exogenous ketones or not? Anthony Gustin: Yeah. I think this goes back to what the individual’s goals are. For instance, I have them most days for the two reasons that I said. If your diet is just to feel good and you do feel good on a nutritional ketogenic diet, then I would say unnecessary. A lot of times what people will do, and I think you had an experience with this, it’s too much, but appetite control is another one. Anthony Gustin: When people are just getting onto a ketogenic diet, they still have either a lot of actual addictions to food or mental addictions to food. Coming from a western diet or a high carb diet, that appetite suppression can be very effective for weight loss that’s sustainable. That’s not gonna last forever on a ketogenic diet. As you said, it is … I think one of the huge drawbacks long-term about the ketogenic diet is it’s so satiating that you can under eat for a long period, leading to hormonal problems, but in a short-term, I think if you are looking for appetite suppressing, this would be a really good tool for that as well. It just depends completely on your individual goals. I see the three as mental production, physical performance, and getting into ketosis or alleviating the symptoms of having problems like that. Leanne Vogel: Yeah. For me, having been ketogenic now for three years in five days … In five days it’ll be my three-year anniversary. Leanne Vogel: Thank you. When I started eating, rather when I started using exogenous ketones, I was finding that I was almost like I could’ve gone, easily, three days without eating. I was like, “Oh wait,” because I do have hormonal issues, and I know that those long periods of fasting just doesn’t resonate with my body. If somebody wants to encourage more fasted state, it’s great for travel. I was using it during my book tour so I would go all day without eating and then after the book tour event, then I would have my first meal, and it worked out well for me, but something to watch for. You mentioned hormones and also adrenal issues before. Do you find that people with low-functioning adrenals have an issue with exogenous ketones, or do you find the opposite is true? Anthony Gustin: I don’t think that there are any inherent problems with adrenal function and taking exogenous ketones. We don’t put caffeine in our product for that reason. I don’t want people to have any more stimulus. If they want to use it, target it, they can. I think that having adrenal problems is a whole other issue in itself, which can be very multi-faceted, but I don’t see any direct connection either medical, positivity, or negativity around adrenal function and exogenous ketones. It’s just another source of energy for your body. It’s not like it’s a stimulant that would be affecting that pathway. Leanne Vogel: Before we get to Perfect Keto and how you guys have formulated your specific product, I’d love to go through some misinformation and concerns around exogenous ketone supplementation, the biggest one being that the information out there says that if you take this product, it’s almost going to tell your body that it doesn’t need to burn fat, and for people that are wanting to lose weight on a ketogenic diet by supplementing with exogenous ketones, they actually won’t be burning fat. True? Not true? Thoughts? Anthony Gustin: Yeah, I don’t understand where this one comes from. Taking exogenous ketones does not stop your body’s production of ketones. In my case, I was at 1.5 millimolar, and they don’t go up, and they don’t last forever. It’s not like you take the supplement and then you are no longer burning fat. Fat burning is a very complex type of bodily function here, and if this were the case, we’ve heard from a lot of people who have taken our stuff, other brands, and supplements, not supplements, and I can guarantee that you can burn fat while taking exogenous ketones. I don’t know why it would just block overall fat burning. I think the misconception is that if you take it, you’re getting the energy from somewhere else, therefore not ever using your energy. However, that could be said about any food source. I guess I would ask those people if they think that eating food also prevents you from burning fat, which I would disagree with. Eating any fat will eventually turn into ketones, and then your body would burn it because you’re eating fat. I would say it’s just a consumed source like anything else. It does not block your body’s ability to do any fat burning. Leanne Vogel: Cool. There are specific companies out there that promote their exogenous ketones as being like you mentioned earlier, that magic pill or that quick fix where you can have your cake and eat it too. Chow down on chips, and candy, and all those carby things that you love, and then just eat our product. My big concern with that and why I have never promoted exogenous ketones up until finding Perfect Keto was that I just wasn’t down with that. I also feel, first off, the emotional problem with that promoting unhealthy relationship with food was a big thing for me. Two is if you have that high blood sugar, my thought would be if you’re chowing down on candy and then you’re taking ketones, it’s not anywhere near diabetic ketoacidosis, but wouldn’t that be an acidic state regardless of how many ketones you end up consuming because of the exogenous ketones? Anthony Gustin: Yeah. I do not recommend that at all. It is not a magic pill. Me looking at all this stuff from a clinical aspect, I agree with you fully that people should be making better choices about their food first and then ask themselves how they can supplement afterward to help out, not use it as an eraser, which is a silly thing to do. If you had a very high carb meal and the next day or later in the day you felt low energy because you’re going through this blood sugar swing, then I think that could be a good time to use a product like an exogenous ketone. I don’t think it’s inherently dangerous to have both high blood sugar and high ketone levels in your body just for the fact that they can easily be excreted through urine. You can use a pee strip to confirm this, that we can easily excrete this. It’s not like something where your body needs to freak out and store it or have any competitive process, but 100% for sure, I would not stack it on top of a carbohydrate high meal and expect you to have any, I guess what you’re saying, erasing of this meal. Anthony Gustin: Yeah, it’s not a carb blocker. That being said, it’s not, I don’t think, an inherently dangerous thing to do it, I just think it’s completely worthless. Leanne Vogel: Yeah, because the ketone levels and the blood sugar levels wouldn’t be high enough for it to be dangerous. Diabetic ketoacidosis, we’re talking about oodles of ketones. By taking exogenous ketones, we’re talking about a couple of millimolars, right? Anthony Gustin: Yeah, that too. You’re not going to be able to get into … If you had high blood sugar, you would have higher insulin, which actually would help to clear it out. What would happen is that would drive the ketone levels down anyways. You could not possibly supplement into ketoacidosis if you had any insulin in your blood. It would be a physiological impossibility. No need to worry about that. Leanne Vogel: Some people say that they feel nauseated or almost foggy brained after taking exogenous ketones, almost like keto flu. Have you seen this before in your practice? Anthony Gustin: I have not. I would ask these people, are they in a full ketogenic state already? Are they transitioning? Do you know any background? Leanne Vogel: I assume it would be people that have been in ketosis because most listeners that are listening to the podcast, we’ve been doing this for a couple of years. Then they tried an exogenous ketone product and they felt like they were experiencing keto flu again, which now that I’m saying this out loud, I guess maybe if you’re not testing, maybe you weren’t in a very deep state of ketosis, and by taking this product you’re not adapting again but feeling what higher ketones would do. I’m not sure. Anthony Gustin: Yeah, that could be it. Also, I would ask, like you said, the level of ketones, where are they at and where are they going? If it’s been so steady for so long, changing your energy system drastically, your body’s gonna freak out a little bit. I guess the question would be, what is the goal of taking exogenous ketones? If that’s the case and you want to try to experience that, slow down and do a fourth scoop, half scoop, three-fourths scoop, and kind of ratchet it up. If you were at between 0.8 and 1.0 for two years and then all of a sudden you go to 3.0 millimolar concentration, your body is probably gonna have a little bit of an adjustment period. Whereas if people swing back and forth, go into ketosis, out of ketosis, they have this term is becoming popular, but probably a little bit more of a metabolic flexibility with your body using different energy sources. That change is probably not as drastic for those people. Leanne Vogel: Yeah. I know that the first time that I took your product, my mind got a little bit … I think it was more efficient, but I wasn’t used to it, so it felt blurry. It took me a couple of days to be like, “Oh, okay. Yeah, it’s just working quicker.” That’s something that I noticed right off the bat. Do you notice that some people have intestinal distress or pain in their stomach when they consume exogenous ketones? If so, how do we go about not experiencing that? Anthony Gustin: Yeah, that’s another thing where if your body is not used to the uptake of ketones, if you’re coming from a high carb diet and then just have a couple of scoops of this stuff, your body is gonna go, “What the hell is going on? Get this stuff out of me.” It will create some massive GI distress. Just like with anything, it’s dosed dependent on the individual, but if you’re experiencing that stuff, I would just cut it by about a fourth and let your body get more accustomed to exogenous ketones and ketone production in general. I’ve seen that if people are in a deep state of ketosis and then have this, they don’t have that problem because of their body, it sees the beta-Hydroxybutyrate molecule and goes, “Oh, we know what this is. Let’s put it over here and use it.” Whereas we don’t have that process in place, your body is very confused about what to do with it and then will try to flush it out. Leanne Vogel: What’s the digestive process of the ketones? You put it in some water, you drink it, and then what happens? Anthony Gustin: It’s just like any other food. It gets digested. It’s attached to a salt. That gets absorbed through the gut, goes to the liver, and then from there, goes into your bloodstream, in which you can use it just like where if you were to break down a ketone body into your liver. Same process, just goes from the GI tract to the liver, to the rest of the bloodstream. Leanne Vogel: Awesome. Let’s switch gears a little bit and chat specifically about Perfect Keto. What drove you to create this product, and how do you see it being different than other products in the marketplace right now for exogenous ketones? Anthony Gustin: We already had Equip, which was a company where I was saying before has a bunch of different whole food products. Like I said, with my clinical experience I wanted to have a ketone product to help with the accessibility and ease of ketosis. There was just nothing at the time when I developed this stuff that had the standards that I wanted and, as I said, accessibility is super important to me. It was just the prices on these things was ridiculous because only one or two companies were selling them at the time. Also, as I said, we don’t put other stuff in our supplements. You’ll notice with the other brand too, the products are just like a beef isolate and cocoa powder, and Stevia, or sweet potato powder in a vanilla powder and Stevia. This allows people to kind of mix and match and uses the products for their own goals. I think that’s a better way to approach supplementation than putting all these proprietary blends in place and saying, “This is the one thing that’s great for everybody for a protein source or a ketone source.” I think that’s silly. Seeing how ridiculously shady the supplement industry is on the back ends, I just wanted to create a product that, number one, I could use and I felt comfortable using, and then two, have accessibility, and lower price, and easy to access distribution. You can buy it on Amazon, our website, and not through having to find somebody who sells it at a very high price. Three, it tasted as well. I didn’t like the taste of anything else that was out there. I think that’s important for compliance for people. If it doesn’t taste good, no one’s gonna have it, which then actually decreases the accessibility. There was just a lot of problems. I’ve gone this route with all the products that I’ve developed where if I see something that I want to use and I think I would refer it to my patients that don’t exist that I want to exist, then I just make it. I was originally gonna put it under the other brand, Equip, but it just didn’t fit. That was whole food based, and I wanted to create a lot of information and content around the ketogenic diet and how to do it. We’re using the Perfect Keto platform as a huge educational resource where people can start experiencing what it’s like for the first time to be in ketosis for the product, then from that go to the website and learn all the stuff about how to use nutritional ketosis for targeted goals. Leanne Vogel: Yeah. It’s so great, and you have such a great entrepreneurial mindset that you’re like, “I want this thing. I’m just gonna make it.” That’s awesome. Anthony Gustin: Just out of frustration, yeah. Leanne Vogel: Yeah, huge. More of my interview with Dr. Gustin after this message from one of our podcast partners. This podcast is partnered with Wolfe Clinic Royal Flora, my choice in soil-based probiotics. Soil-based probiotics are a fabulously effective approach to repopulating the gut. The soil-based organisms are cultured in decayed plant matter free from pesticides, chemicals, and toxins. Unlike conventional probiotics, which have a shortened shelf life, are vulnerable to stomach acid, weakened by processing methods, and less likely to reconstitute or colonize the GI tract to the level we need it, soil-based probiotics are alive and thriving, meaning they colonize along the entire GI tract, rapidly forming into the bacteria your body needs most as soon as it interacts with saliva. Soil-based probiotics from Wolfe Clinic, called Royal Flora, is my choice in soil-based probiotic, and my gut has never felt less bloated. I’m not reacting to foods in the way that I used to, for example, spaghetti squash. I can eat it, no problem. It’s great. US and Canadian listeners receive 20% off when you order from healthfulpursuit.com/gut. Use the coupon code “GUT”, all in caps, no spaces, for the 20% discount to be applied to your order. We talked a little bit about the salts used in exogenous ketones. What kind of salt is in Perfect Keto, and does it matter? I know that there’s a lot of information out there that depending on what type of salt and whether you use magnesium or potassium to bind it to, that it makes it more bioavailable, depending on the source. Anthony Gustin: Yeah. We have sodium, calcium, and magnesium, those three split. I did a lot of testing on this product with a lot of different people. We just tinkered around with a ratio we have. If another company wants to steal our stuff, go ahead. All of our stuff is completely transparent so just look at our label. You can take whatever ratio you want, make another product, but that, to me, was the one that one, increased ketone levels the most as well as two, reduced the GI distress the most. If you had it just bound singularly to sodium or potassium or magnesium, that’s still another thing that your body has to process in whole, which can leave to some GI distress as well. It took us six months of testing, back and forth, back and forth, back and forth, to try to figure out the most effective and the one that tasted the best, most effective and had the least amount of potential side effects. Leanne Vogel: What’s the difference between the ketone esters that you see and the ketone salts? Which is your product and why? Anthony Gustin: Esters are very difficult to manufacture currently and taste bad. Those are suspended into a liquid. An ester is essentially an unbound ketone body. It’s just a beta-hydroxybutyrate molecule that your body will instantly absorb. There have been some studies back and forth. For the salts, ketone salts are just the ketone body attached to salt, which makes them more stable, which is why they can be made into a powder. The ketone ester is something that has a little ways to go as far as making them taste anywhere close to consumable. I think our stuff tastes pretty good. Sometimes people don’t realize that it’s a supplement and not a candy cane. They can complain a little bit about the taste. If that’s the case in our product, if we were to make an exogenous ketone ester, it would not be good for anybody. I’ve had some before, and some people call it jet fuel. I think that’s a generous term to describe them. They’re disgusting. There’s been some preliminary research. D’Agostino has done some stuff around esters versus salts. Esters can boost your ketone levels more immediately in the short term. I have seen testing with myself and some others that esters can boost only short term whereas the salts can have a little bit more of a long term effect. We’re looking at half an hour to 45 minutes versus a couple of hours. That’s the difference between the two. 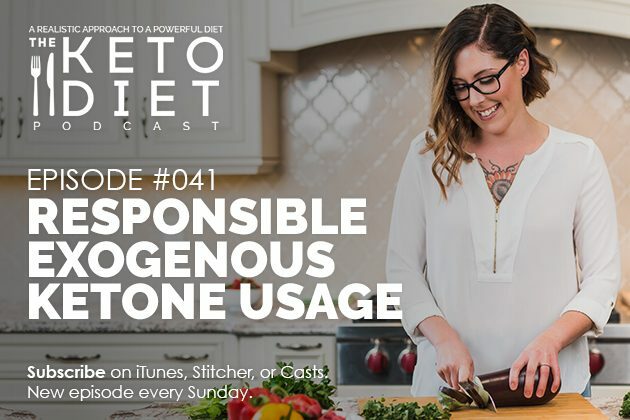 Leanne Vogel: Let’s chat a little bit about ingredients because I’ve looked at a lot of exogenous ketone products and not even understood why they put what they put in their product. Let’s chat a little bit about the products that you could have put in your product that you didn’t and also what the problem is with some of these ingredients. Anthony Gustin: Yeah. A lot of the supplement industry is just an industry standard ingredients. What happens is you go to a manufacturer and say, “Hey, I want this.” They say, “Okay, let’s also put X, Y, and Z in it.” You go, “Okay,” and then that’s what’s made. Not only that, a lot of manufacturers end up putting in products that you don’t have to put on the label but are in products anyway that help the processing of the machines in the manufacturing plant. A lot of that stuff is either due to wanting to improve the taste, the mixability, the look of it with artificial colors and sweeteners and stuff like this, or just the processing of the machines themselves. I don’t know of any other supplement company who does this because it took me about 15 manufacturers to find one who would be compliant, but I negotiated a price. We pay a lot more to be able to not have all these weird fillers and processing aids because if we make the product, but our manufacturer can run less of the product through a manufacturing line because they have to clean the machine more because we don’t put these flow agents and processing agents in it, then they’re losing out on more business. We had to pay a lot more for that, but we were looking at magnesium stearate, a lot of these gums and fibers and stuff like that that just, in my opinion, is not necessary to make a product like this. When I’m doing this, I want to be very intentional with what we put in it. Like I was saying before, the intention is to get people exogenous ketones. They shouldn’t need anything else. That’s why we keep the ingredient profile super simple. It’s essentially just beta-Hydroxybutyrate, chocolate, and Stevia. It doesn’t get much cleaner than that. Leanne Vogel: I know that you have an MCT oil powder. Why isn’t it in Perfect Keto? Do you find that, what you said earlier, that you like to give people options to add things and change their supplements as needed? I’m a big fan of that as well. Is that why you chose not to put the MCT oil powder just straight in the Perfect Keto exogenous ketones or was there another reason? Anthony Gustin: Yeah, individual customization. Leanne Vogel: Yeah, that’s the best way to go, I find. Anthony Gustin: Yeah. There’s also a patent held for combining beta-Hydroxybutyrate and MCT powder. We would be able to use that, if possible. Full disclaimer to people who have reached out to us from one of the other brands and saying, “You just don’t do this because there’s a patent.” We have that patent license if we want to use it, we just choose not to in our products for the reason that we want, like I said, some individual customization so you can have whatever you want from whatever product. Just mix it together yourself without having to put all the stuff in there. Leanne Vogel: Yes, that’s what I do. I got my mom to try it a couple of days ago. They’ve been living with us, my parents, for a little while. My mom tried Brain Octane MCT oil a couple of months ago. She was texting me saying, “Oh my gosh, my brain. This is so cool.” Then I gave her your product and put some MCT oil powder in there. She was so happy for the whole day. Her entire mood changed and she was so lit up. Even having parents around you that are happier is also a great reason to get some of this product and then have your parents happier because of it. It was so cool to watch her transformation over the day of just combining the two and having them for the whole day. She loved it, so thank you for that. Leanne Vogel: Yeah, exactly. “Makes parents happy, especially when they live with you.” Let’s go through the differences between Perfect Keto and Keto OS. I mentioned some of these in my previous podcast episode, which I’ll link to in the show notes, where I kind of compared the two just from my experience. I’ve said in that podcast episode, and I’ll say it again, I’m not down with Keto OS individually, for me, because of their marketing and because it’s inaccessible to a lot of people. I can’t just send people to a place where they can get it. They have to find somebody, and order from them, and also the caffeine, and the dairy, and trying to find the differences in the cost was just too much for me to handle. I didn’t feel comfortable promoting it. I did see that on the book tour, I was meeting with people, and people were doing the exogenous ketone thing, and they were using it. I figured I have a responsibility to find something that is accessible, and less expensive, and the ingredients are pure. From your perspective, where do you see the differences between Perfect Keto and Keto OS? Anthony Gustin: We have a little infographic type of thing made that’s floating around. I think if you just search “Perfect Keto Keto OS,” you can see. Our opinion, the number one thing, like you said before, the transparency on the ingredients. We say exactly what is about our stuff and how it’s broken down, versus proprietary blends. As well, we want to make this just an exogenous ketone product and not stuffed with caffeine, and tea, and all this other stuff. I don’t think that their carb amount is going to make that much of a difference, honestly, but if you’re somebody who is a little bit more sensitive to the lower end of carbohydrates, theirs I think is two or three and ours is zero. As you said, the accessibility as well, we just want as many people to have this product as possible and not make an exclusive little club around it. The price as well, I think, is the biggest thing. I think we’re at half of the price. Those are the main points to me. Leanne Vogel: Awesome. We chatted a little bit about who exogenous ketones are good for, but can we chat a little bit about Perfect Keto specifically and who it’s maybe good for, who it’s not so good for? I guess we should start off by saying, I’m reiterating because I know you’ve said this a couple of times, but just to bring it home, will Perfect Keto get you into ketosis regardless of following a ketogenic diet or not? Anthony Gustin: It will, temporarily. Leanne Vogel: Awesome answer. Regarding the benefits of longevity, reducing inflammation that you get from Perfect Keto, would a person get the same benefits if they just eat keto, specifically for inflammation? Leanne Vogel: If they just eat keto versus taking Perfect Keto, will the inflammation be reduced because of higher ketone levels, I guess you could say. Anthony Gustin: I would say unknown at this point. We’re running a few studies currently with administrating the Perfect Ketones with two different populations of cancer patients as well as one with traumatic brain injuries. We’re gonna be looking at some of those markers with and without the product. I’ll tell you unknown at this point, but we will see. Leanne Vogel: Cool, awesome. I can’t wait for that. More of my interview with Dr. Gustin after this message from one of our podcast partners. This show is partnered up with paleovalley, the makers of the only 100% grass fed and finished fermented beef stick. Each stick contains one billion probiotic CFUs. We all know how important fermented foods are to the health of our gut and the strength of our immune system. Chowing down on paleovalley’s fermented beef sticks provides your body with all of the beneficial bacteria it loves in one convenient little beef stick. Their gut friendly sticks are gluten free, soy free, dairy free, GMO-free, freaky chemical additive, dye, and preservative free, as well as being 100% free from carbs and sugar, and made with the highest quality ingredients. Exclusive to listeners of the show, receive instant savings of 20% off paleovalley fermented beef stick snacks by going to paleovalley.com/keto. If your jaw is just tired thinking about beef jerky, it’s worth noting that these tasty treats are not tough at all, but moist with a little snap. The summer sausage flavor even tastes like those hickory summer sausages but without the gunk, seriously delicious. Again, that’s paleovalley.com/keto for an instant 20% off savings. We chatted a little bit about weight loss just in regards to the misconception out there that if you take exogenous ketones, your body will stop burning fat. I’m assuming because that’s not necessarily true that if somebody wanted to lose weight on a ketogenic diet and they were already eating keto and using your product, they could probably be helped by annihilating stubborn weight gain. Is taking Perfect Keto correlated with weight loss? Anthony Gustin: If it leads to things like more energy, which leads to more movement, or reduction in appetite, stuff like this, I think that will lead to weight loss. It is not a weight loss supplement that leads to magical weight loss. Please, if you’re thinking about getting this stuff and you think you’re just gonna drop pounds overnight … We get some bad reviews sometimes saying, “I’ve taken this for three days, and I haven’t seen the scale move, one star.” To be clear, it is not a weight loss product. It is not going to lead directly to fat loss. It will be the step that encourages different lifestyle choices along with it that leads to fat loss like getting easier into ketosis, having higher compliance in ketosis, having higher output physically in ketosis, the appetite suppression. Those are the things that are going to lead to the long-term fat loss if that’s your goal, not the product itself doing a wave of the wand kind of fat loss. If that were the case, I’d probably be doing this podcast from a spaceship right now. Leanne Vogel: Oh my gosh, that would be so cool. I love just how honest you are, and that’s something that I appreciate because, in the space of health and wellness, there isn’t a lot of honesty. I just want to take a moment and thank you for that because it can be quite hard, even as running a podcast and a business, to try to align yourself with brands that are just like, “This is who we are, this is what we do, take it or leave it, and no, this isn’t a magic pill.” I think too often it is like that. Anthony Gustin: As a clinician when I was working way more one-on-one with patients, it would be very frustrating for me to have them come in and have expectations set by other people. There are some people going around like certain people with a bone broth protein that says it can fix any gut problem essentially. Then people come in taking it and expecting that. When I say, “No, it requires all of this work to get done to fix your gut,” they are very disappointed and angry with me. I want to prevent any of that and help people as much as possible. For that to happen, I think setting expectations in a way where it takes work to reach any goal, whether that be fat loss, performance, or mental productivity. This is just a tool to help guide you in the right direction, not a one size fits all solution. Leanne Vogel: Awesome. We haven’t chatted much about whether or not Perfect Keto is good for everyone or are there people that should not take Perfect Keto or maybe chat with their doctor beforehand? Anthony Gustin: Yeah. If you’re pregnant, I would say chat with your doctor about it. If you have had any major illness before and you’re tracking any serious internal problems, I think it’s good … We’re doing some studies on it for things like cancer and other metabolic processes like that, but if you have any major illness, I would say chat with your doctor about using any products. I would say not great for people who are trying to perform at the highest level if they’re just eating ketones all the time and in nutritional ketosis. I would say like I was mentioning earlier, I don’t think the ketogenic diet is a one size fits all solution for everybody. I think that it does work for a lot of great reasons, but it’s not this or that. You can only eat fat and ketones, exogenous ketones, or you can only eat carbs. I think there’s room for both, depending on your goal. Leanne Vogel: Awesome. One last question and I’m pretty sure I know the answer to this, but I always want to check. FODMAP. Your product should be fine for people that are sensitive to FODMAPs right? Leanne Vogel: There’s nothing to react to. Okay, cool. Oh my gosh, we got through all the things that I wanted to pick your brain on. Is there anything else you want to share that you feel like we didn’t cover when it comes to exogenous ketones or even Perfect Keto itself? Anthony Gustin: I guess if people have questions or if they have suggestions of what they want for content, we’re investing a lot of time and energy into trying to build it up to be as helpful as possible. Even if that’s a product recommendation, or any information that you’re looking for that you can’t find, or anything that’s unclear, let us know. We will help as much as possible by getting that out there. You can contact alex@perfectketo.com. He’s head of our website and content team, but we just want to create as much clarity around this stuff as possible and make sure, like I was saying before, it’s not this veil where it’s like, “This is good for everything.” We want people to use this for their goal if it fits for their goal. Leanne Vogel: Amazing. Where can people find more from you? Anthony Gustin: I’m online. Primarily on Instagram is where I’m active. That’s just @dranthonygustin, and then Perfect Keto is @perfectketones and perfectketo.com. Any questions, feel free to reach out whenever and we’ll help as much as possible. Leanne Vogel: Sweet. I’ll include all those links in the show notes as well as a couple of other things that you mentioned throughout the episode. If people are interested in accessing any of those links, you can go to healthfulpursuit.com/podcast/e41 or the show notes just accessed through your app. We will include a transcript for this episode, which will be available on that link about three to five days following the initial air date of this episode. Thanks so much for coming on the show, Anthony. I appreciate it. You’ve answered a lot of our questions. I have a full list of notes to add to the show notes, so I appreciate you coming on the show today. Anthony Gustin: Thank you so much. Do we have a code for your listeners? Leanne Vogel: We do. It is “HEALTHFUL” all in caps, no spaces, for 15% off. I’ll include that in the show notes as well. Thanks for the reminder. Anthony Gustin: You got it. Leanne Vogel: Sweet. That does it for another episode of the Keto Diet Podcast. Thanks for listening in. You can follow me on Instagram by searching “healthful pursuit” where you’ll find daily keto eats and other fun things. Check out all of my keto supportive programs, bundles, guides, and other cool things over at healthfulpursuit.com/shop. I’ll see you next Sunday. Bye.